Published on 26 November 2016 by teleSUR. The leader of the movement that won Cuban independence and champion of the Global South has died in Havana. Fidel Castro, former president and leader of the Cuban revolution, died Friday night at age 90, Cuban state television confirmed. Raul Castro, Cuba's President and Fidel Castro's brother, announced that Fidel would be cremated on Saturday. "The commander in chief of the Cuban revolution died 10:29pm tonight," said Castro. Born in 1926 to a prominent landowner in Holguín Province, Cuba, Fidel went on to lead Cuba’s revolutionary independence movement, defeating the U.S.-backed Batista dictatorship in 1959. Soon after his movement took power, Fidel adopted an explicitly socialist model of development and forged strong ties with the Soviet Union, earning the wrath of the United States. On 25 and 26 March the first National Cuba Conference to be held in the United States since 1979 took place at Fordham Law School in New York. 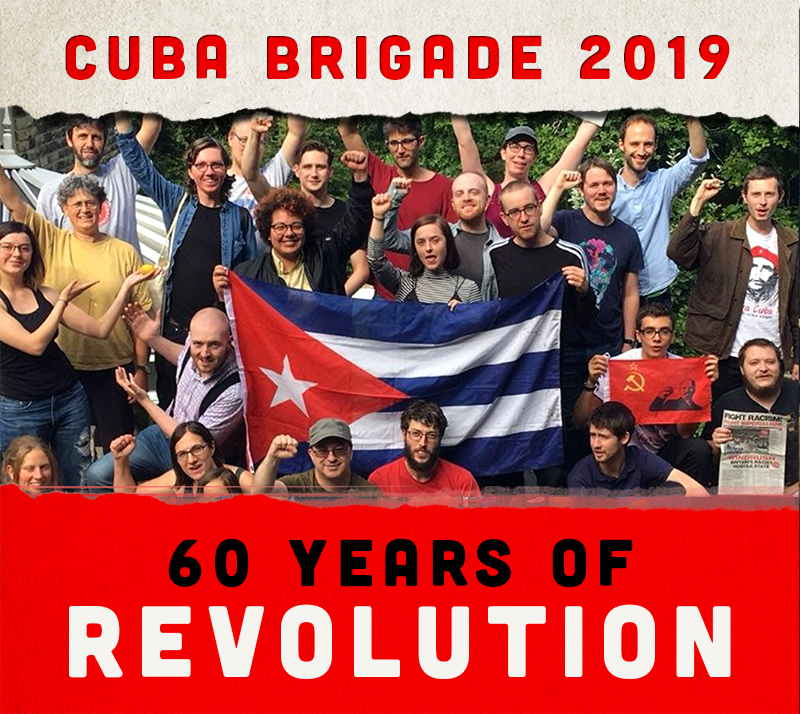 The conference demanded the full normalisation of US-Cuba relations; the elimination of the US blockade, the return of US-occupied territory in Guantanamo and an end to US regime change programmes. These are essential demands for the international movement in solidarity with socialist Cuba at this complex juncture; with the possibility of renewed aggression from the new Trump administration, and with the challenges faced both in its process of economic restructuring and the pending transition to a post-Castro era. Helen Yaffe reports. Cuba and the United States re-established diplomatic relations in the summer of 2015, 54 years after they were broken off, and six months after Presidents Raul Castro and Barack Obama astonished the world with their announcements on 17 December 2014. Rapprochement was possible because Obama became the first US president since 1959 to abandon conditionality and talk to Cuba. In his first term, he had demanded concessions or preconditions from Cuba as a prerequisite to talks. Cuba never submitted to conditions being imposed on it. Likewise, Cuba dropped its historical precondition of refusing to restore diplomatic relations while the US blockade remains. With the restoration of diplomatic relations, embassies were opened; the US removed Cuba from its list of states supporting terrorism; the Havana Club rum label was registered in the US, resolving a 20-year-long ownership dispute; coastguard cooperation issues were resolved; regular flights and postal services were restored after decades. High profile prisoner releases took place on both sides. Obama eased restrictions on US citizens’ travel to the island, although this still requires a licence. In 2016, over half a million US citizens travelled to Cuba from the US – half of them Cuban-Americans. In his final days as President, Obama eliminated the ‘wet foot, dry foot’ policy which encouraged illegal and dangerous emigration by Cubans, by granting them automatic residency in the US and citizenship within one year. However, in the commercial and economic area, progress has been minimal. Since the Helms-Burton Act of 1996 codified the blockade in US law, a vote in the US Congress is necessary to eliminate it, but by using his executive powers decisively Obama could have virtually dismantled it. In September 2015 and 2016, he signed annual extensions on the Trading With the Enemy Act against Cuba, one of the laws which sustains the blockade. Obama took only small, strategic steps to ‘engage’ Cuba by signing executive orders (which can be rescinded) to bypass Congress. His administration introduced five packets of measures and granted licences for a handful of US companies to trade with and/or operate in Cuba: six telecoms firms; four cruise companies; one hotel; eight airlines; two small banks. In mid-December 2016, Google signed a deal with the Cuban government to install servers on the island to speed up internet access. Regulations issued under Obama state that financial institutions can provide Cuba with finance and credit for its authorised operations. However, no US bank has been willing to do this. Banks are terrified of fines being imposed by the Treasury Department’s Office of Foreign Asset Controls (OFAC) while Cuba remains on the list of countries under US sanctions. And for good reason: Obama fined a record-breaking 49 entities for dealing with Cuba; more than President Bush. Effectively, Cuba still cannot use the dollar in the international economy, nor make deposits in international banks. Cuban goods still cannot be exported to the US; the one exception in more than 50 years being 40 tons of artisanal charcoal produced by Cuban cooperative farms and imported in January 2017 by Scott Gilbert, the attorney who represented US government contractor Alan Gross, released from prison in Cuba in 2014. Published on 12 October 2016 by Granma. Despite the establishment of a historic dialogue with Havana on December 17, 2014, and regardless of the official visit of President Barack Obama to the island in March 2016, Washington continues to apply economic sanctions against the Cuban population, sparking the incomprehension of the international community. Established in 1960, during the Cold War, the sanctions (an economic, commercial and financial blockade of the country) persist more than half a century later, cause major difficulties for the Cuban economy and inflict unnecessary suffering on the most vulnerable sectors of the population. Their high cost and extraterritorial reach prompt unanimous rejection by the international community. However, the resolution of this asymmetrical conflict depends on the executive branch of the U.S. government, which has the necessary prerogatives to dismantle much of the framework of the sanctions imposed on the island. Published on 11 October 2016 by Granma. “It is now vital to identify the damages precisely and as quickly as possible, in order to determine what is needed in each place,” Army General Raúl Castro Ruz stated during a working meeting held this Monday, October 10, at the Municipal Defence Council. Raúl outlined the key issues for the recovery of the municipality of Maisí, where the towns of La Máquina (the municipal capital), Punta de Maisí and Los Llanos, were the hardest hit with the passage of Hurricane Matthew. The President of the National Defence Council was accompanied by Army Corps General Ramón Espinosa Martín, deputy minister of the Revolutionary Armed Forces, who is currently based in the most affected areas, together with other national and local leaders, overseeing the measures implemented in the recovery stage. Published on 13 August 2016 by teleSUR. On the occasion of his birthday, Fidel Castro penned a brief article recalling some of his earliest memories, while also calling for peace. Every corner of Cuba is celebrating celebrate the 90th birthday of the country's most famous man: Fidel Castro. The Karl Marx Theater in Havana hosted a special gala on Saturday night, where some of Fidel's oldest comrades, including some of those who accompanied him in the attack on the Moncada barracks, are expected to join. Foreign dignitaries and heads of state have also travelled to Cuba to participate in the events commemorating the 90th birthday of the leader of the Cuban Revolution, Fidel Castro. In late September 2016, US President Obama extended the Trading With the Enemy Act, the principal law that the United States unilateral blockade against Cuba. Almost two years since announcing the intention to re-establish diplomatic relations with Cuba and ‘normalise’ relations, his fine words about ending an ‘updated and failed policy’ ring hollow. The Obama administration has taken only small, strategic steps to dismantling the apparatus of hostility built up by US imperialism against revolutionary Cuba. The objective of US policy remains regime change in Cuba. Formally, a vote in the US Congress is necessary to lift the blockade, but Obama could use his Presidential prerogatives to remove many more elements of the blockade than he has done. Using his executive powers decisively would enable him to virtually dismantle the blockade. Meanwhile the US blockade continues to have a severe detrimental impact on every aspect of life in Cuba, some of which are summarized in Cuba’s 2016 report to the United Nations General Assembly. On 26 October, for the 25th consecutive year, the General Assembly will vote on Cuba’s motion to condemn the US blockade. Last year, the US voted against the motion, backed by its reliable ally, Israel, and opposed by 191 countries. The international solidarity movement must now step up its demand for the end to the blockade. You can vote against it on this website: http://www.cubavsbloqueo.cu/en. On Friday 30September at 9pm UK time (4pm in Havana) there will be a Q&A about the Blockade and Cuba/US relations with Josefina Vidal, head of Cuba-US relations in the Cuban Foreign Ministry. You can contact Josefina via @JosefinaVidalF. This coincides with the 4th Bilateral Commission meeting between the US and Cuba. - Despite the restoring of Cuban-US diplomatic relations, the reopening of embassies over a year ago, and President Barack Obama's visit to Cuba in March 2016, the US economic, commercial and financial sanctions against Cuba remain in place, as do the laws which support them, while the restrictions they generate continue to be applied. The blockade constitutes a basic obstacle to the process aimed at normalizing the relations between the two countries. - The amendments made in 2015 and 2016 by the US Treasury and Commerce Departments, to some of the regulations of the blockade policy in order to modify their implementation; while they constitute steps in the right direction, they are not enough. - The US continues to ban exports to Cuba of products and equipment important to key sectors of the economy, while the persistence of the blockade prevents Cuba from freely exporting products and services to the US; it cannot have direct banking relations with the US or, except in the case of telecommunications, receive US investment in other sectors of the economy. - Despite the March 2016 measure authorizing use of the US dollar in our international transactions, there are still no normal banking relations between the two countries. Cuba is banned from opening correspondent accounts in US banks and has been unable to make either deposits or payments in cash in US dollars in third countries. Among international and US banks, a climate of fear and hostility remains, as to involving themselves in legitimate operations with Cuba. - The deterrent and punitive elements of the blockade, and extraterritorial in scope, continue to operate to the detriment of Cuba. They are still blocking transfers of funds, still withholding payments, even in currencies other than the US dollar; they deny us services of all kinds, even where sought by our diplomatic missions and offices abroad, while foreign banks and other entities with links to Cuba continue to be fined. - Examples include the decision by the German Commerzbank to cease operations with Cuba following a fine of US $1,710 million imposed on it by the US in March 2015. - More recently (August 2016), it proved impossible to pay for Cuban medical services in Algeria, in the maternal & child and ophthalmology areas, because two correspondent banks - Commerzbank and the Belgian KBC Bank - refused to action a credit transfer of €12,527,945 ordered by the Bank of Algeria. - While authorization is being granted for visits by US citizens to Cuba under a general license in the 12 categories permitted by US legislation, and scheduled flights between the two countries have been restored, US citizens are still banned from vacationing freely as tourists in Cuba, under a law which can only be repealed by Congress. - The economic damage caused to the Cuban people, based on very conservative estimates and taking into account the depreciation of the dollar against gold in the international market, amounts to $753,688,000,000, despite the decline in the price of gold compared with 2015. At current prices, the cumulative cost of the blockade to the Cuban people totals $125,873,000,000. Between March 2015 and March 2016, the cost to Cuba of the sanctions amounted to $4,680,300,000 at current prices. - The president of the United States still possesses wide executive powers, which he has not used, to continue modifying the application of the blockade regulations beyond what has already been done to date. These would enable him, if used decisively, to virtually dismantle the blockade policy (although its complete elimination requires a decision by Congress). - The scope for significantly amending the application of the blockade by the exercise of executive powers is self-evident from the measures taken by the Treasury and Commerce Departments in 2015 and 2016, and from the removal of Cuba, in 2015, from the list of states sponsoring international terrorism, on which Cuba should never have been included. - For its part, the US Congress has yet to approve any of the 20 bills with bipartisan support proposing the lifting of some of the blockade sanctions, and even the lifting of the entire blockade. - At the same time, Congress has received some 51 anti-Cuba legislative initiatives, many designed to reinforce basic aspects of the blockade’s application, prevent the President from passing new executive measures, and blocking the implementation of those already passed. - The blockade against Cuba must be removed unilaterally and unconditionally. It is the most unjust, severe and prolonged system of sanctions ever imposed on any country, and remains a flagrant, massive and systematic violation of the human rights of the Cuban people. - The blockade constitutes the greatest obstacle to developing the full potential of the economy and wellbeing of the Cuban people, and to Cuba's economic, trade and financial relations with the US and the rest of the world. - Given all the above, for as long as it remains in force, Cuba will maintain its demand for an end to the economic, commercial and financial blockade imposed by the US. - The draft resolution we will present reflects the current status of bilateral relations between Cuba and the US; we reiterate our appreciation of the restoration of diplomatic relations and the US President's expression of willingness to work towards the lifting of the blockade, reaffirmed during his historic visit to Cuba this year. - The mobilizing role of the international community as regards the removal of the sanctions against Cuba is an essential one, and is an important factor of support for President Obama and his successor, and also for those members of Congress who second the elimination of this cruel policy, in the face of their opponents and critics. - The international solidarity and support enjoyed by Cuba during these long, difficult years has been a key factor in the in the change in the US policy towards Cuba. - Cuba reiterates its gratitude for the permanent support of your country to the demand by the Cuban people for an end to this illegal, genocidal and extraterritorial policy, which will never prevent the Cuban people from defending its sovereignty and its unfettered right to choose its own future. - We hope to enjoy again your country's support in the forums at which this issue is raised, especially at the UN General Assembly during the general debate, and your country's vote in support of the resolution against the blockade, on which action will be taken on October 26th, 2016. Published on 24 July 2016 by teleSUR. Today, progressives throughout the world could learn many lessons from the July 26 1953, Moncada attack led by Fidel Castro, writes Arnold August. This movement, supported by allies who later rallied to the cause, led to the January 1 1959 triumph of the revolution. The rest, as the saying goes, is history. However, history is still being made today as Cuba endures major challenges.